Sermon delivered by Fr. Vazken Movsesian on November 27, 2011 - Advent season begins with this MUST HEAR sermon, explaining the reason for the season and emphasizing the purpose of Christianity. The lesson is from the Gospel of St. Luke - the Rich Fool who built Bigger Barns! This sermon sets the pace for the Holidays and Christ's Revelation at Christmas. At the conclusion of the sermon, the annual Christmas tree is lit, inviting donations to the needy of the world. Recorded LIVE at the St. Peter Armenian Church and Youth Ministries Center. Two sermons: In Armenian - On the gift of humility as expressed by Jesus Christ; in English (at minute13:05) on St. Andrew, the First Called Disciple. Sermon delivered by Fr. 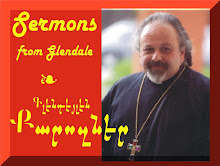 Vazken Movsesian on November 13, 2011 and recorded LIVE at the St. Peter Armenian Church and Youth Ministries Center.